Susan Greene, conceived and directs the ORSMP. 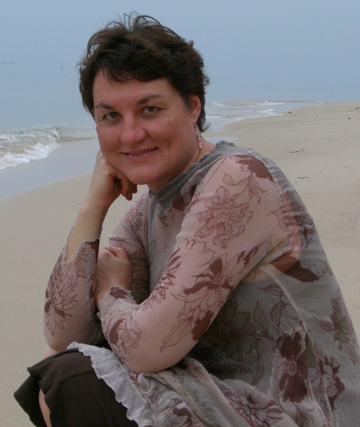 She is an artist, educator and clinical psychologist. Her practice straddles a range of cultural arenas, new media, and public art, while focusing on borders, migrations, decolonization and memory. 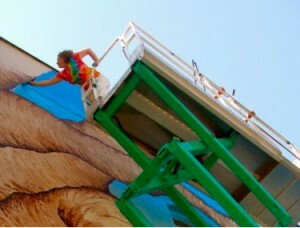 Greene is one of four Jewish American women artists who formed Break the Silence Mural Project in 1989. Break the Silence artists have returned to Occupied Palestine numerous times to facilitate community mural projects, conduct arts workshops, and create sculpture in refugee camps in Bethlehem, Ramallah, Nablus, Beit Hanoun and Rafah. They have presented their work to high school, university, and community audiences across the United States including at the San Francisco Art Institute, Art Institute of Chicago, and the Alternative Museum in New York. The group has also produced an award winning video. Greene has led or participated in more than 30 public art projects worldwide. Originally from NYC, she has been a resident of the Bay Area 25 years. Greene is visiting faculty at the San Francisco Art Institute and has a private psychotherapy practice in San Francisco. Josh has lived in Olympia for 10 years. He embodies art as a tool for change. His creativity brings this movement of solidarity to life with humor, grace, and great intelligence; he is a catalyst for action and connections between people from all parts of our community. 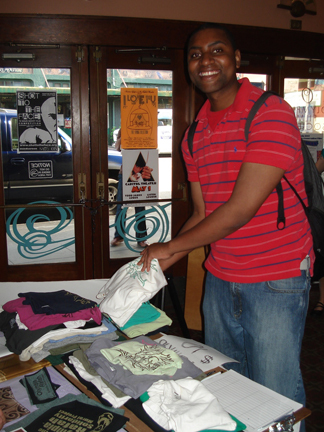 Josh is currently an outreach coordinator for ORSMP. Josh has been the coordinator of the Committee in Solidarity with the People of El Salvador (CISPES) and witnessed the triumph of real democracy in El Salvador in 2009. He works with the Olympia Movement for Justice and Peace (OMJP). 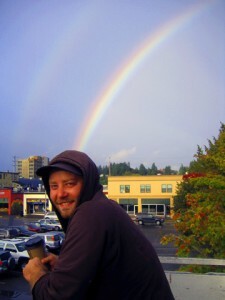 Josh participated in the forming of the organization for the Olympia Port Militarization Resistence (OlyPMR). He was a key organizer for the ‘Immigration and Border Dialogues Conference in 2008, and the birth of Bridges Not Walls: an immigration rights group in the South Puget Sound region. Josh was saught out and encouraged to be a lead production and outreach facilitator for the Olympia Rafah Mural Project. Hilary Hacker graduated from with a master’s degree in Strategic Communications through The Center for Creative Change at Antioch University in Seattle. She recently finished two years working as an AmeriCorps VISTA, Community Partnership Catalyst at The Center for Community-Based Learning and Action at The Evergreen State College where she worked to involve students in the greater Olympia community and to create and sustain campus-community partnerships. Because of her work with a variety of community groups, organizations and social justice issues as well as her experience with outreach and media Hilary has jumped right into the swing of the Steering Committee. Her focus is in immigration and she realizes the connections that capitalism, and imperialism play internationally as well as at home in the United States. She is a member of Bridges Not Walls and works to educate her community about the horrors of our current immigration system and the ways in which we can use our privilege of citizenship as a catalyst for change and be allies to those who are members of targeted communities. Along with being a representative of Bridges Not Walls Hilary currently works with Inmigrantes Unidos de Shelton and Mason County Literacy. 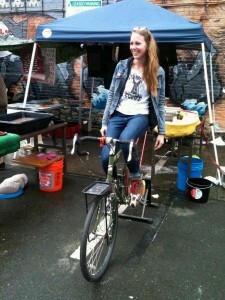 Alicia Martinson has worked as a project coordinator for the Olympia-Rafah Solidarity Mural Project for over two years. As a student at the Evergreen State College Alicia began working on the project as an intern in the spring of 2008. Alicia has worked on different aspects of the project including fundraising, administration, coordinating interns/volunteers, community outreach, and production. 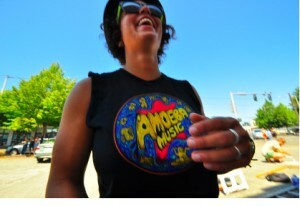 While at Evergreen Alicia focused on political and social studies, studying the relationship between art and activism. She has completed two murals in Minneapolis, MN and has worked in collaboration with Project Director Dr. Susan Greene and many other artists on the artistic vision for this mural. After graduating from Evergreen Alicia worked full time as the lead local project coordinator in Olympia and facilitated the participation of over 40 local organizations. She is currently working on the next phase of the project, gathering audio files from each organization in order to expand the projects mission and create more opportunities for building change. Patricia Vazquez is an artist and community educator born and raised in Mexico City. She has lived in Olympia, WA for 7 years, where she has focused her efforts in the immigrant community. Her artistic work explores the intersections of race, sexuality, gender and nationality, among other issues, and their influence in the formation of identity. 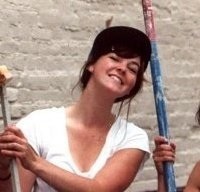 She joined the ORMP team last year, facilitating the connection of the local organizations working on immigrant rights with the Mural. 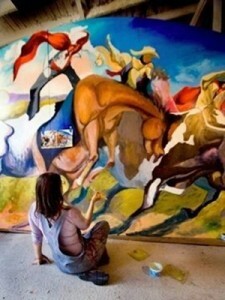 She also developed and painted some of the images in the Mural. 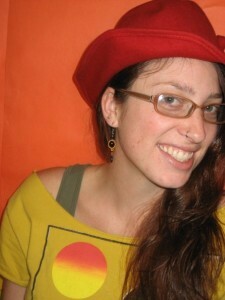 Jessi Meliza is a video artist/documentarian. She is recording footage for the Mural Project. Jessi works in both narrative and documentary work, often including animated sequences and various incorporated media including book art, experimental music and installation presentation of her works. She was awarded a juried prize at a local film festival. Eric Sarai is a graphic design professional with over 10 years experience working in the creative field. After attending Kent State’s School of Visual Communication in Ohio, Eric moved to Chicago where he worked for a number of non-profit organizations including CURE : Against Epilepsy and SOS : Children’s Villages of Illinois. In 2006 Eric founded Eris Graphic, a contract graphic design studio now based out of a home studio in lovely Olympia Washington. Eric possess exceptional visual design skills and the ability to consistently over-deliver. 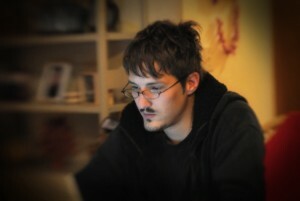 Eric is not a designer that hides behind the computer. He can be hands-on and always leaves a professional impression. Eric is now a key component in working on the downtown Olympia-Rafah International Solidarity Mural Project with the Rachel Corey Foundation. Raine Wholey is a visual artist and studied political economy at The Evergreen State College. Raine has facilitated murals with Summerfield Waldorf High School and the Graton Day Labor Center in CA, and ROOF Community Services in Rochester WA. Raine worked with the ORSMP in the summer of 2009, coordinating design and painting of a few local Olympia organization’s leaves. The leaves she was most focussed on were with SafePlace; the Olympia domestic violence shelter, Camp Quixote; a self governed homeless camp, and a few young men from the Native Culture Group at the Greene Hill youth prison with the program Gateways for Incarcerated Youth. She hopes to use the popular education model with visual art and political economy in her future community work. Sarah Weiss is working as an Intern for the ORSMP. 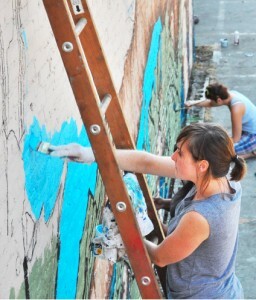 Sarah became a volunteer for the project in January 2009, and later became an intern in the spring working on fundraising, outreach and publicity as well as helping with the mural. 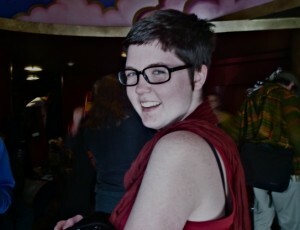 As a student at the Evergreen State College, Sarah studies a variety of subjects but focuses particularly on visual arts. Sophie has been living in Olympia since 2007 and became an intern for the Olympia Rafah Solidarity Mural Project in the spring of 2009. As a student at the Evergreen State College, she has studied political activism, political economy, environmental science and poetry. During the spring, she wrote and performed a spoken word piece at the DAM show and continues to use her poetry background to perpetuate social change. Anna Rose Eggleton is 10 years old and is the youngest person committed to the mural project, having done extensive pictoral documentation of meetings. She has protested the occupation for 6 years and has hosted a visitor from Palestine in her room. She likes art, reading, playing the cello and animals, especially deer. Candio is an artist who has exhibited her work nationally from the street to the club to the contemporary arts center to the museum and back to the street. Also a writer taking part in the Palestinian solidarity movement in Olympia, WA since the death of Rachel Corrie, she has published several articles in the Electronic Intifada on the subject. Marion Pollman’s playfulness is readily revealed through her ceramics. Her organic forms are alive with color; each piece can make you smile and begs to be touched. “To make the world beautiful” is the moving force of Marion’s life. Through her work, Marion Pollmann Ceramics, she has found her way. Moving to the U.S. in 1994, she first turned her creativity toward designing her own home. There she added gardens, growing organic vegetables and herbs along with flowers. With all of this accomplished she grew restless, ready to put herself into something new. But what? One day in 1997, she took a pottery class. “Watching the teacher throw pots on the wheel,” she remembers, “I was so overwhelmed by the experience of watching creation right before my eyes. Right away, I knew I was ‘home. '” She’s had her hands in clay ever since. For the next several years Marion took all the classes she could find to learn about working with clay. She soon abandoned the potter’s wheel in order to hand build her own forms. Her highly unique designs caught people’s attention and she’s been selling her work to delighted customers ever since. Marion never lacks for inspiration, often waking up from a dream with a new design idea in mind. Her travels throughout Europe and in the South Pacific influence her work in interesting ways. Her vases are inspired by her earlier life in Europe where, she says, people give much more importance to flowers and vases in their homes. Time in Tahiti brought forth her ceramic baskets and two lines of dishes: Tahiti Dinner Set and Tutti Fruitti. In 2006 Marion added a large gas kiln to her studio and started to create large sculptures and garden vessels up to four feet tall. Their forms are both surprising and pleasing, adding beauty to your home or garden.